Miyajima is an island in the Hiroshima Bay of Japan. 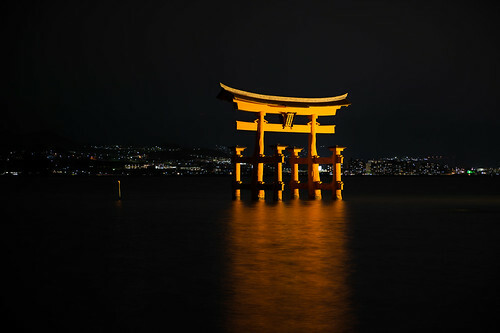 The best known structure on the island is the Torii gate that appears to float on the water at high tide. At low tide, you are able to walk out to the gate. Most of the island is protected wilderness. The island has a traditional rice dish that involved an oversized rice spoon. There is a lot of history behind this rice spoon, it is everywhere on the island, and is not found outside of the island. They also make small cakes in a maple leaf shape that are delicious. They catch an oyster in the nearby waters, which can be prepared anyway you can imagine (raw, grilled, etc). From Tokyo, you can take the Nozomi Shinkansen to Hiroshima Station. This train takes about 4 hours. The JR Pass does not cover this train. From Tokyo, you can take the other Shinkansen trains, which take about 4.5 hours, requires a change of trains, and saves around USD$100. The JR Pass does cover this train. There is also a ferry from Hiroshima to the island which takes about 50 minutes. If you have a JR Pass, the train from Hiroshima to Miyajimaguchi and the ferry to Miyajima are covered by your pass. Be careful, as there are 2 ferry companies next to each other at the docks. One is JR (covered by your pass) the other is not JR. If you do not have a JR pass, both ferries are about the same price and run on the same schedule. There is much more to the island than its shrine. There is a cable car to the top of the island. The cable car costs around 1500Yen (about USD$15). How much time should you spend on the island? I would allow for at least one full day. If you can stay on the island, it is really a neat place at night, especially if you can time the high tide to occur after dark. On the higher side, unless you have a good reason, more than 2 days is overkill. There are not a lot of hotels on the island. You can stay in Hiroshima, but keep an eye on the ferry schedule. You can also stay near Miyajimaguchi, but once again, keep an eye on the ferry schedule. If you stay on the island, you are likely staying in a Ryokan, or Japanese Hotel. These may or may not have ‘Western’ bathrooms and showers. If they do have the ‘Western’ bathrooms and showers, the rooms are likely limited. A ‘Western’ bathroom and shower is what most Americans and Europeans expect from a hotel. This page has a list of English speaking hotels – http://visit-miyajima-japan.com/en/prepare-your-stay/accomodation.html (look for the flag of Great Britain). I have personally stayed at the Jukeiso ( http://www5a.biglobe.ne.jp/~jukeiso/index02.html ) and the Auberge-Watanabe ( http://www.auberge-watanabe.com/english/ ). The Jukeiso can be better described as a small hotel. The Watanabe was one of the neatest very small hotels I’ve ever seen (I think they only have 3-4 rooms). Most places on the island have limited ‘Western’ style accommodations, and many do not take credit card reservations on the internet (for the Watanabe, I had to call them to give them my credit card information). Many places (including the two places I stayed) have dinner and breakfast included in the cost of your stay. One really interesting thing at the Watanabe was two large replicas of WWII battleships. There was a Japanese battleship with a name I cannot remember, and the American USS Missouri. The replicas are works of art, and were created by a friend of the Inn’s grandfather. While on the island, the local’s ability to speak and understand English may be very limited, much more so than a large city. Many locals who understand both languages are very helpful, and will give you words and phrases if you ask.